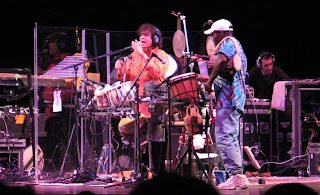 10/27/07, Orchestra Hall: In his book Drumming at the Edge of Magic, Mickey Hart writes of meeting the 18-year-old son of legendary Indian tabla player Ustad Alla Rakha. "You and my son are of the same generation," Alla Rakha told Hart. "I know you will get along. You can play with each other, teach each other, become brothers of the drum." That was in the late 1960s. Last night, the two brothers—Hart, former drummer with the Grateful Dead, and Zakir Hussain, now arguably the most famous tabla player in the world, a national treasure in his native India, and a prodigious artist who has worked with George Harrison, Ravi Shankar, Van Morrison, John McLaughlin and Shakti, as well as with Hart (their co-created, co-produced Planet Drum CD won the first Grammy award for world music, in 1992)—joined Nigeria's Sikiru Adepoju and Puerto Rico's Giovanni Hidalgo onstage at Orchestra Hall for an evening of what Hart calls "deep drumming." Adepoju and Hidalgo were also part of Planet Drum, so the Global Drum Project (the tour and the new CD of the same name) is a reunion. Not everyone loved it; some people left almost immediately after the music began (were they expecting Osmo? ), but the rest of us were richly rewarded with an ecstatic trance of rhythm and noise that lasted nearly two hours. The stage was filled with percussion instruments. At stage right, Hidalgo the conguero danced among congas, bongos, djembe, cymbals, bells, and gourds, playing most with his hands. 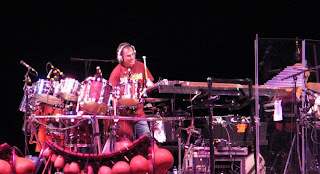 Wearing a Golden Gophers T-shirt, Hart took center stage with his version of the trap set and beyond: something that looked like a xylophone, something that looked like a zither (and was played with a metal bar), and countless more objects he would pick up to beat, rub, stroke, shake, or sometimes just contemplate; percussionists seem to spend a lot of time considering what sound they want to make next, even during live performance. Hussain and Adepoju were at stage left, Hussain surrounded by his many tablas and other Indian instruments (including what looked like metal beaver tails), Adepoju holding his talking drum in his armpit. To Hart's left, behind Hussain and Adepoju, was a fifth man, Jonah Sharp, whose job, in Hart's words, was "computer enhancement and spectral processing." Both the CD and the live performance use digital technology and ambient electronics, looping and amplifying and manipulating the sounds of traditional acoustic instruments into something new and transformative. The concert began with Hart and Hussain playing old-growth redwood roots Hart introduced as the Squid and the Double Dolphin. It ended with the two old friends playing side-by-side African balofons—xylophones with gourd resonators. In between was music made with sticks, brushes, hands, fists, skins, strings, wood, bamboo, metal, beads, rainsticks, hammers, mallets, broom, voice, and breath; Hussain's singing (tikatikatika) was another percussion instrument. It's hard to understand why some people left. Percussion is easy. After the voice, percussion must have been the first music, and the human body the first instrument. Denying the power of percussion seems like denying the power of one's own heartbeat. 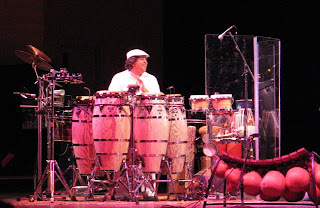 Photos, top to bottom: Mickey Hart; Giovanni Hidalgo; Zakir Hussain, Sikiru Adepoju, and Jonah Sharp. The Dakota, 10/22/07: A ticket to a Joey D show is one of the sure things in jazz. The music will be great, the vibe will be positive, and a good time will be had by all, including the musicians. Ever since Jimmy Smith died in February 2005, Joey has been the acknowledged King of the Hammond B-3 Organ, but he still acts the same: amiable, relaxed, happy to be seated before a 400-pound monster of an instrument with two keyboards (and 122 keys), two octaves of foot pedals, multiple presets, stops, and special effects, and a separate cabinet called a Leslie with rotating speakers that give the B-3 its big, juicy vibrato. B-3s aren't made anymore; the last one was assembled in 1975 at Hammond's factory in Melrose Park, Illinois, a Chicago suburb where my grandparents lived. There are B-3 synthesizers but they're not the same. When I'm in a room with a Leslie, I feel a breeze. Joey D's group was the classic B-3 trio: organ, guitar, drums. (Who came up with the idea of putting a guitar together with a B-3? It never seems like it will work, but it does.) Jake Langley is Joey's regular guitarist, and he was with him at the Dakota; Byron "Wookie" Landham must have had other obligations, so Carmen Intorre sat behind the drums, looking 12 years old. They played "Autumn Leaves," the theme from the 60s television show Naked City, and the Ray Charles classic "I Got a Woman." From where we sat, I could see Joey's feet do their mad dance on the foot pedals. 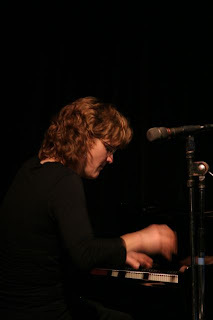 After that, vocalist (and Joey's fiancee) Colleen McNabb sang "Don't Go to Strangers" while Joey played the trumpet and the B-3 at the same time. Then Colleen sang the Bill Evans tune "Waltz for Debby." Colleen studied with Patricia Barber and has absorbed some of her laid-back cool. Joey announced that "The Sound of Music" would be their final tune, then gave us one more: "Nice 'n' Easy," made famous by Frank Sinatra. This time, Joey played and sang. He should sing more often. Maybe he could sing, blow the trumpet, and play the B-3 simultaneously? If anyone could, he's the guy. Photo by John Whiting. Left to right, seen from the Dakota mezzanine: Joey, Colleen and Carmen, Jake. Joey's trumpet and mute are on the B-3. Andrea Canter and I are co-writing an occasional series of CD reviews called Doubletime. 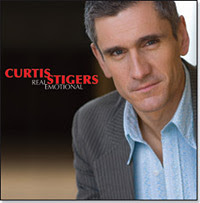 Our latest, on singer Curtis Stigers' Real Emotional, is now available. 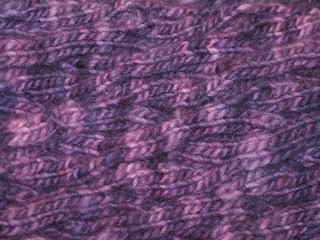 Find it on Andrea's Web site, JazzInk. We both like Curtis, but we don't always agree on this CD. We do agree on Kurt Elling's Nightmoves. Describing her most recent project, Red Earth: A Malian Journey, Grammy-winning jazz vocalist Dee Dee Bridgewater uses words like “reawakening,” “spiritual awakening,” and “journey home.” It’s one thing to read an artist’s claims to growth and evolution. It’s another to witness that transformation firsthand in live performance. I was at the fourth and final show of Bridgewater’s two-day stay at the Dakota. 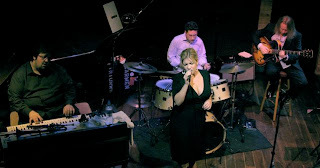 I had seen her perform twice before—in 2002, during her tour for her Kurt Weill CD, This Is New, and again in 2006 for J’ai Deux Amours, her Grammy-nominated album of French love songs. The Dee Dee who walked on stage two nights ago was not the same Dee Dee I remembered from either previous time. 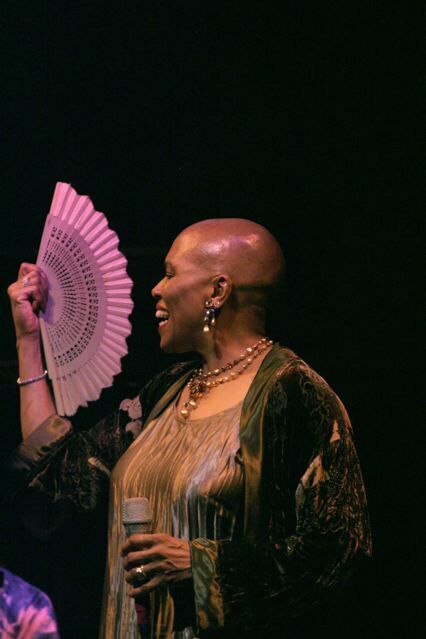 Wearing pleated gold silk and velvet, head shaved, surrounded by musicians she loves, performing music that makes her spirit soar (her words), she was radiant, resplendent, and infectiously happy. She told us what the evening would bring: that as a result of her journey to find her African ancestry and reclaim her roots, she would be merging the tradition of Mali, “where in my heart I know I come from,” with the tradition of jazz. We would, she promised, “experience the similarity between African-American culture and African culture.” The Dakota stage was crowded with her colorful band and their instruments, many made by hand. Along with her regular trio of pianist Edsel Gomez, bassist Ira Coleman, and drummer Minino Garay, they included musicians from Mali and Senegal: Cherif Soumano on kora (precursor to the harp), Lansine Kouyaté on balafon (precursor to the xylophone), Baba Sissoko on tamani (talking drum, held under the arm) and ngoni (precursor to the banjo), Moussa Sissokho on djembe (hand drum) and congas. They would be joined during the set by two ethereal Malian vocalists, Kabine Kouyaté and Mamani Kéita. All of the African musicians, Bridgewater explained, are griots: storytellers, historians, keepers of tradition. Back when Mali was a kingdom, before colonization and coups and crushing poverty, griots were advisors to kings. Bridgewater’s first journey to Mali was as an ambassador to the United Nations’ Food and Agricultural Organization (FAO) in 1999. 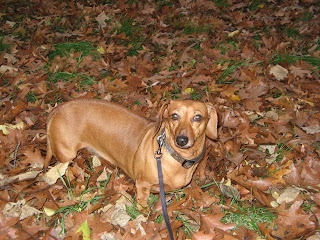 She returned in 2004, drawn back to the place she had come to believe was her ancestral home. Her original plans were to record a CD of jazz and Malian music in France, where she now lives, with musicians who had emigrated there from Mali. Instead, she went to Mali again in 2006. Most of Red Earth was recorded there; it was appropriate—and incredibly lucky for us—that she brought Malian musicians along on her limited U.S. tour of only five stops also including the Blue Note in New York, the Kennedy Center in Washington, D.C., and the San Francisco Jazz Festival. The CD’s opening track is Mongo Santamaria’s “Afro Blue,” and that was the song Bridgewater began with at the Dakota. Standing among her musicians, wrapped in polyrhythms, singing “shades of delight/cocoa hue,” she glowed. Then the majestic Kabine Kouyaté joined her for “Sakhodougou” (The Griots), a song of celebration for a successful hunt. After an introduction by Soumano on the kora, Bridgewater sang in English, Kouyaté in Bambara; when he sang, she sat at his feet. Rising, she scatted. And it all fit and flowed together: instruments, languages, voices, cultures. This was not jazz laid on top of African music, or jazz performed against a backdrop of African music, or even jazz side-by-side with African music. It was not Paul Simon’s Graceland. (Aside: I love Graceland, and without it, the West would probably not know Ladysmith Black Mambazo, but Graceland is Paul Simon’s music laid on top of African music.) Bridgewater and the Malians had merged into something lucid and joyous and whole. I would use the word “fusion” if it didn’t evoke Spyra Gyra and the Rippingtons. When Kabine Kouyaté left the stage, Mamani Kéita entered for “Djarabi” (Oh My Love), written by Malian diva and women’s rights champion Oumou Sangaré, who sings it with Bridgewater on the CD. What began as a tender ballad of alternating Bambara phrases and English interpretations (“All my life I have searched and searched for someone like you to love”) escalated in intensity—vocal and instrumental—until Bridgewater was giving us a taste of over-the-top soul singing, a bit of Mary J. Blige, and it still all fit. At the end of the song, her head was perspiring. The final song was on the horizon. It was late, two hours since the set had begun. Then someone on the audience requested Nina Simone’s “Four Women,” and Bridgewater said, “We cannot refuse.” Soumano re-tuned his kora, Coleman opened with a powerful bass solo, and Bridgewater tore the house down with Simone’s scathing, bitter mini-epic about four African-American women whose lives are affected by subtle differences in their skin color. When Bridgewater danced and shouted the song’s end, “My name is Peaches!” (following a splendid piano solo by Gomez), we couldn’t imagine that she or the band had any energy left. We were wrong. “Compared to What” is a funky ’60s anti-war soul song made famous by Les McCann and Eddie Harris. It actually includes the archaic phrase “Sock it to me now!” but other lyrics are timely in a horrid, history-repeats-itself way: “The president, he got his war/Folks don’t know just what it’s for/Nobody gives us a rhyme or reason/Have one doubt, they call it treason.” Kora, balafon, and tamani, Malian beats, and chants in Bambara wove through and around the piano, bass, drums, and English, and once again, it all made sense and formed a perfect whole. At the start of the song, Bridgewater ordered us to stand up, and we did; had she asked us to storm City Hall with scythes and torches, we probably would have done that, too. The stage filled with people dancing, an ecstatic and exuberant salute. It was, in fact, the last song. No one could have asked for more. What a pleasure it is to spend an hour each week with jazz musician, composer, and educator Kelly Rossum and a small group of people who enjoy jazz. Our class at MacPhail goes by too quickly. Tonight we heard and talked about recordings by the Original Dixieland Jass (Jazz) Band, the all-white quintet that made the first jazz record in 1917. We learned that jazz is the oldest style of music almost completely documented by recording (the history of jazz parallels that of the recording industry), and we tried to imagine what it must have been like to hear this crazy, rebellious party music for the first time. 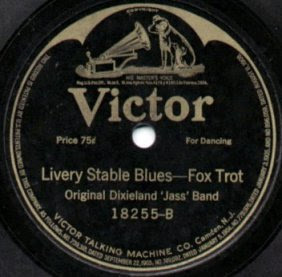 People enjoyed it; "Livery Stable Blues/Dixie Jass Band One Step" sold over a million copies. We also listened to "West End Blues," the 1928 recording by Louis Armstrong and his Hot Five that changed everything. Meanwhile, I learned that a C on the piano is not the same as a C on a trumpet, a cornet, a saxophone, or almost any other instrument. Excuse me? How is it possible for jazz musicians to play together--and make things up (improvise)--when their instruments all have different tunings? Ow, ow, my head hurts. For more on this topic, see "Jazz Musicians: The Ultimate Multi-Taskers." Orchestra Hall, 10/14/07: Pat Metheny, Christian McBride, and Antonio Sanchez gave us more than two hours of terrific music at the 2007-08 Northrop Jazz Season opener. Metheny played several different guitars, including a baritone and a four-neck monster with 42 strings called a Pikasso. (Until then, the most awesome guitar I'd ever seen was Fareed Haque's hybrid guitar-sitar.) Bassist Christian McBride and drummer Antonio Sanchez were Metheny's rhythm section; in an interview with the StarTribune's Britt Robson, Metheny said, "They are like an elephant and a bull, two very different but very strong kinds of power." I've seen McBride several times (including as a leader) and always enjoy his virtuosic, imaginative playing and his sheer physical presence. Sanchez I've seen just twice before: at IAJE in 2004 with David Sanchez and Miguel Zenon and at Monterey in 2005 with Metheny, McBride, and David Sanchez. This time I was really able to focus on Antonio Sanchez: how he plays with a compact efficiency that's both expressive and fierce, and how he seems to have multiple limbs, all moving at the same time and all pounding out different rhythms. I don't know Metheny's music, so while the crowd greeted the opening notes of several tunes with claps and whistles, I was glad when Metheny took a break and told us what they were playing: an opening improvisation, "Make Peace," "Unrequited" (from Metheny's CD with Brad Mehldau), "Sound of Water," "So May It Secretly Begin," "Day Trip" (the title track on the CD the trio will release in January 2008), "Bright Size Life" (the title track from Metheny's first studio release on ECM in 1975), "Question and Answer." Toward the end, Metheny and McBride played a lovely duet of "My Romance," after which Metheny and Sanchez played a duet of their own (beginning with big drums BAM BAM BAM from Sanchez). Orchestra Hall doesn't seem able to figure out the proper sound treatment for anyone but its own resident orchestra. Most of the show was overamped, and there was too much guitar at the expense of the bass and drums. Often the sound was distorted and almost painfully loud. I hope they do a better job with the Global Drum Project later this month. So, what's with Pat Metheny's hair? Metheny is one of the world's most acclaimed, accomplished, and talented musicians, and his hair looks like...never mind. I won't say anything mean about a musician I respect and admire. Besides, that might open the door to a rant about Joey Calderazzo's ratty t-shirts. But must Metheny, an otherwise good-looking, rangy dude, be the Don King of jazz? 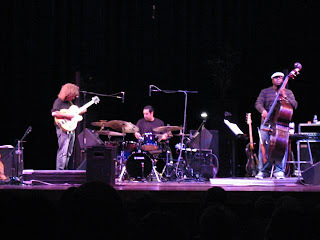 Photo: Metheny, Sanchez, and McBride on stage at Orchestra Hall. A we-were-there shot snapped with an Elph from the 10th row. 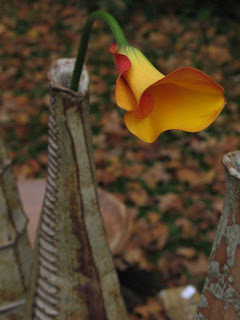 The 2007 Western Wisconsin Pottery Tour is now in its fourth year. We crossed the St. Croix toward Wisconsin's rolling and still green fields. Cows grazed, horses galloped, and creamy clouds dotted the sky. It was a perfect day for a drive in the country, where potters like to live, often at the end of bumpy dirt roads. We began at the studio of University of Minnesota ceramics professor Mark Pharis and architect/potter Wayne Branum in Roberts, then went to see work by Jay Jensen, Wendy Olson, and guest Mike Helke from Minneapolis. From there we drove to Doug Johnson's place, a beautiful setting where the air smelled so sweet I briefly entertained the thought of moving to the country. (Pristine vistas, quiet, birds...bugs, isolation, no jazz clubs.) Next stop: Randy Johnston and Jan McKeachie Johnston, then the Victorian home and studio of S.C. Rolf in River Falls. Rolf is one of the tour's organizers (with Willem Gebben, whose studio we didn't get to). We first met Rolf at the Uptown Art Fair five years ago, where we talked about tea bowls (yunomi) and he said something that informed how I've looked at pots ever since: For him, a tea bowl is a sketch. In conversation at his home, he said he takes tea bowls very seriously because they're so intimate; people cradle them in their hands and touch them to their lips. Rolf's guest was Winona potter Chuck Aydlett, who makes fantastic teapots. We ended the day with dinner at Stone's, a modern restaurant in a historic building in Stillwater. If you go, try the creamed corn. Photos by John Whiting. 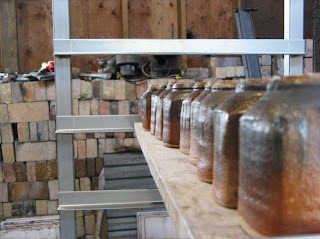 Top to bottom: Fire bricks and tea bowls at the studio of Mark Pharis and Wayne Branum. 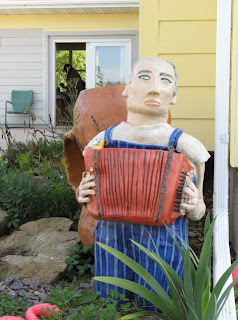 Ceramic yard art by Wendy Olson. 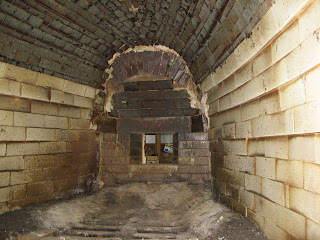 Inside the anagama kiln at the Johnstons'. • To get on the mailing list for next year's Western Wisconsin Pottery Tour, send an email to scrolf.potter1@sbcglobal.net. • To get on the mailing list for next year's Minnesota Potters' Tour (the big one, held on Mother's Day Weekend), send an email to potters@minnesotapotters.com. Dara Moskowitz Grumdahl, a food critic I enjoy reading, gave Cafe Ena a bad review, and it's one time I honestly didn't understand what she was talking about. I've been to Ena several times, and each time it gets more interesting. The South American-French fusion food (French because, we were told, the chef is French-trained, and a lot of dishes come with colorful sauce squiggles) is prepared imaginatively and well, and the service is usually excellent. The menu keeps changing and the specials (scallops with mascarpone mashed potatoes, pork loin with a chorizo tamale and black beans) are definitely worth trying. Ena has become the restaurant we often suggest when friends ask, "Where should we go to eat?" Our friend Andrea should have her own booth there by now, or at least a small brass plaque. Tip: If you want a booth (and you do), ask for one when you make your reservation. Visit the Artists' Quarter in St. Paul and you'll be greeted at the door by Davis, who will take your money, share a poem, tell you about books he's reading and plays he's seen, and generally make you feel welcome. Later he'll introduce the performers ("Lords and ladies! Cats and kittens! We're pleased and flipped! "), do a bit of Lord Buckley if you're lucky, and return to his post by the door. He's as much as part of the AQ as the musicians who grace its stage, and he helps keep it classy and smart. 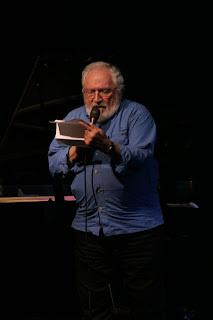 Here's Davis reading a poem about Monk during Laura Caviani's annual Monk's Birthday concert. Photo by John Whiting. Artists' Quarter, 10/10/07: Each year, pianist and composer Laura Caviani celebrates Thelonious Monk's birthday (and the day before her own birthday) with an evening of Monk's music at the AQ. This year, she was joined by Adam Linz on bass and Phil Hey on drums. (Adam leaves soon for three weeks of sold-out performances in France and Germany with Fat Kid Wednesdays.) Laura teaches when she performs, which I appreciate, letting us know what she is playing and telling us a little about each selection. ("San Francisco Holiday" was originally called "Worry Later" because whenever Monk was asked its name, he'd say, "I'll worry about that later.") 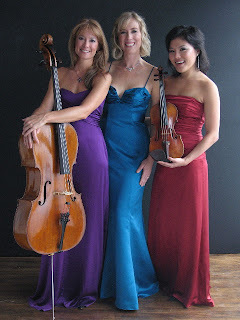 The trio gave us inventive arrangements of already inventive tunes. How can you make "Bemsha Swing" even more intricate? By playing the melody with the right hand, and also with the left hand...a half-beat or so behind, as Laura does, making me wonder if somewhere along the way she had the halves of her brain surgically separated. If listening to Monk is "difficult," as some have said, you couldn't tell from the crowd of smiling people nodding their heads and tapping their feet. Some were musicians and teachers (in the house: Eric Kamau Gravatt, who will perform at the AQ with his band Source Code on Friday and Saturday; Matthew McCright, an instructor in piano at Carleton College, where Laura also teaches; vocalist Lucia Newell). The two generous sets included "I Mean You," "In Walked Bud," "Epistrophy," "Monk's Dream," "Ask Me Now," "Bright Mississippi," "Rhythm-a-ning," "Coming on the Hudson," "Bemsha Swing," "Let's Call This," "Sweet and Lovely" (during Adam's bass solo, you could hear him sing "Sweet...and...lovely...."), and the finale, "Blue Monk." Between sets, cake was served; talking got louder around the bar during the second set, probably due to the sugar rush. I've always thought that Monk's music had a lot of math in it, but beautiful math--less about calculations and memorizing multiplication tables, more about planetary orbits and the geometry of snowflakes. I could never play it in a million years, but I can enjoy it when it's played as well as it was last night. As the couple sitting behind me said, "What a great way to spend a Wednesday evening!" "And for just six bucks!" There’s been a lot of buzz about Christian Scott. 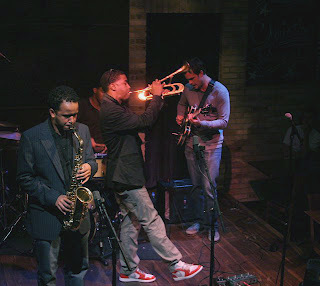 Just 24 years old, New Orleans born and bred, Berklee educated, the personable young trumpeter played a one-night stand at the Dakota on Sunday, October 7. Just two weeks earlier, we’d seen him at the prestigious Monterey Jazz Festival. He arrived at the Dakota with three members of the band he’d played with in Monterey, Louis Fouché on alto sax, Luques Curtis on bass, and Matt Stevens on guitar. Andrew Marsh on drums rounded out the quintet. Lacking a piano player, Scott occasionally laid his horn down and did some comping of his own. The late show at the Dakota began with a beautiful interpretation of Wayne Shorter’s “Footprints,” a showcase for Scott’s unique tone: breathy, eloquent, older than his years. 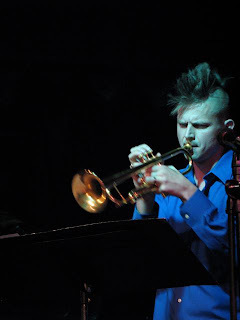 Some critics have compared Scott to Miles Davis, an inevitability when anyone new picks up a trumpet; others describe his tone as more like Ben Webster’s. Scott counts Davis among his many influences, which also include Louis Armstrong, Roy Eldridge, Dizzy Gillespie, and Freddie Hubbard. His tone whispers, cajoles, elucidates, caresses (he’s young enough to be my son, so I’ll be careful here), but can also breathe fire when he wants it to. “Katrina’s Eyes,” the original tune that followed “Footprints” in the Dakota set, is a track on Scott’s second CD, Anthem, recently released on the Concord label. (His debut CD, Rewind That, came out on Concord in 2006 and earned a Grammy nomination.) Like Terence Blanchard, another New Orleans musician whose life was changed by Hurricane Katrina, Scott felt compelled to say something about the storm’s devastation and aftermath. Anthem is for Scott what A Tale of God’s Will (A Requiem for Katrina) is for Blanchard, a personal expression of the inexpressible. It’s interesting that “Katrina’s Eyes” is not, as Scott explains, about the hurricane. Instead, it’s based on a dream Scott had about fathering a baby girl—something you don’t know unless you hear him perform it live and introduce it himself. He heard the theme in a dream, awoke to find the baby not there, and felt a deep sadness and loss, which permeates the melody. Scott told us the story about “Katrina’s Eyes,” and about the next tune he played, which was based on an encounter with a racist in Boston. “I’ll show you what my trumpet sounds like when it gets angry,” he said, and did, breathing fire. As we heard earlier in Monterey, Scott likes to preface his songs with stories. He’s a bit of a ham but not a show-off; his stories are interesting and add flavor to his music. The living got easy again with “Summertime,” a version that showcased Stevens’s guitar. They followed with what Scott termed “Mardi Gras 101,” a call-and-response based on the music of the Black Indian tribes of New Orleans. This went over so well that Scott decided to give us “Indian Blues” next instead of another track from Anthem. A now-classic blend of jazz and Mardi Gras music, “Indian Blues” was originally recorded in 1991 by Donald Harrison Jr., Scott’s uncle (and himself a Mardi Gras Indian chief since 1988). This was announced as the final tune of the set, and we were told that Scott doesn’t do encores, but he surprised us and did, ending with “Litany Against Fear” from Anthem. As he had done in Monterey, Scott prefaced his performance with a story about the song’s origins: meeting a little boy in New Orleans’ 9th ward whose big brother had just been arrested and who was afraid of the “bad police.” The more I hear this song (live and on CD), the more I like it. The hypnotic, repetitive opening phrase (played by pianist Aaron Parks on the CD) is a security blanket for Scott’s trumpet and Stevens’ guitar as they lead us through a series of emotions: grief, mourning, and ultimately hope. Scott may be in his early 20s, but he’s thinking grown-up thoughts, which can happen when your life gets blown out from under you. After the show, we headed for the green room to say hello. Scott had already positioned himself at the club’s front door so he could greet people as they left. We had a brief conversation, during which someone mentioned dogs. Scott had two beloved Labradors, both lost during Katrina when he was forced to leave them behind. Later this month, Scott plays the Blue Note and Sculler’s, then heads back to New Orleans for the Voodoo Music Experience. 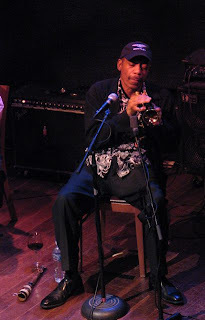 In November, he goes to the US Virgin Islands for the St. Croix-New Orleans Jazz Festival. Catch him if you can, wherever he lands. I once spent an awestruck afternoon in Muir Woods, but that was on the ground looking up and up and up. 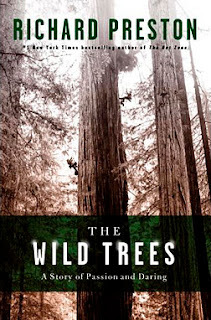 Richard Preston's book The Wild Trees: A Story of Passion and Daring tells of people who hunt for giant trees, then climb them, study them, sleep in them (in specially made hammocks), get married in them, and hang from ropes looped over branches hundreds of feet from the ground. You want them not to fall (some do) so you can learn more about what it's like to go where they go--where no humans have gone before. There are a few too many names in the book, and the narrative moves around in time a bit much, but it's a fascinating tale of exploration and discovery; these men (and one woman) are vertical Marco Polos. Preston himself is an expert tree climber who has passed on that gene of desire to his own children; they take exotic climbing trips as a family. He tells us more than I wanted to know about the personal lives of the people in the book, but the science is deeply interesting, and when he describes the trees themselves--their height and mass and majesty, the gardens that grow in them, how impossibly old they are--he approaches poetry. 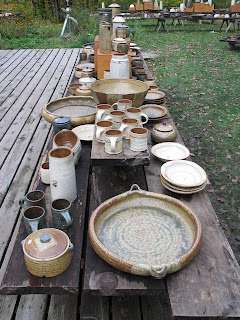 Potter Robert Briscoe is having his fall studio sale at his home in the woods in Harris, with guest potter Jason Trebs. Bob is part of the annual St. Croix Valley Potters' Tour, which draws fans and collectors from across the US every Mother's Day weekend. 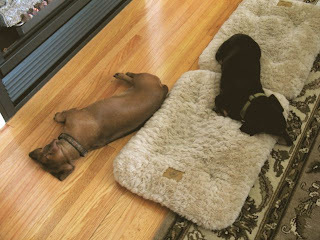 The fall sale is smaller, more relaxed and social. 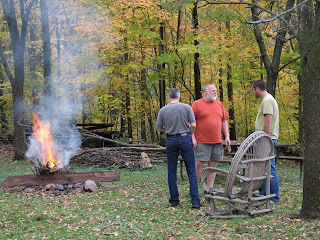 The beer is cold and the food is excellent; weather permitting, Bob builds a roaring campfire and people gather around. Friends come and stay late. On Friday, someone brought a guitar; at least three people there could play, so the guitar got passed around and for while at dusk and into the night, we sang or listened or sang along while the fire blazed and sparked and Bob gave it the occasional kick to keep it in shape. After dark, people wandered the grounds looking at pots with flashlights. The first piece of pottery I ever bought was one of Bob's bowls. That was 20 years ago, and I still like it. Photos, top to bottom: Calla lily in a tall pot by Jason Trebs. Bob wearing his red "I Still Make Mudpies" shirt. Pots for sale. I've liked drummer Dave King since I first heard him play with the Bad Plus sometime in 2000. BP pianist Ethan Iverson and bassist Reid Anderson no longer live in the Midwest, but Dave still does, and he plays around town in many different bands including (but not limited to) Happy Apple (with Michael Lewis and Eric Fratzke), Halloween, Alaska (James Diers, Matt Friesen, Jake Hanson), F-K-G (Scott Fultz, Dean Granros), the Starry-Eyed Lovelies (Lewis, Anthony Cox, Dean Granros), and most recently Buffalo Collision (Tim Berne, Iverson, Mat Maneri) when they came to the Dakota in mid-September. For those dates, violist Maneri couldn't come, so cellist Hank Roberts was the string section, which turned out more than fine; hearing Hank play was a revelation. In December 2003, we also heard King at the Artists' Quarter. The AQ had scheduled Siamese Fighting Fish (Granros, Cox, and King), but Granros had a family emergency and pianist Craig Taborn was in town and agreed to step in. They dubbed themselves Garcia and played two great nights. That's jazz. About the hat: Dave King shaves his head. And he lives in Minnesota. When he was here with Berne, I asked permission to measure his head, which he graciously granted. 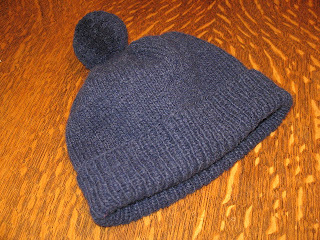 Hand-knit from deep blue Italian cashmere, topped with a pompom (King specifically requested a pompom but left the rest up to me), the hat is finished and ready to send. P.S. I didn't know this at the time, but Dave King's hat would lead to several more hats for jazz musicians and other cool people associated with the music we love. HH came up with "Hats for Cats" and it stuck. P.P.S. I've decided to call Dave's hat "Hat Zero." Where it all started. Jazz is a global art form which, through improvisation, combines traditional and popular music of multiple cultures within a modern social context. I came to jazz in the 1980s through the fusion door--David Sanborn, Jeff Lorber, Jean-Luc Ponty, Stanley Clarke, the Yellowjackets. One day I heard a tune by Thelonious Monk on the radio. Soon after, I met Suzan Jenkins on a school field trip with our children. What a lucky break for me. Suzan and Willard Jenkins are encyclopedias of jazz. They took a laid-back approach to my jazz education...basically "Try this, you'll like it, then try this." Now I get to learn from Kelly, along with others who share a passion for the music. And I get to hear a lot of live jazz because I live in a town with a lot of venues, thanks in large part to Leigh Kamman, who hosted jazz radio shows for more than six decades. Before Leigh, someone noted in one of the many articles written about him prior to his retirement from Minnesota Public Radio last month, this was mostly a polka town. I like Kelly's definition because it clearly describes the nature of jazz: Global. Art form. (In the days of the Depression and swing bands, jazz was popular music, but today it's art music.) Improvisation. Combination. Multiple cultures. Jazz is big, broad, and full of surprises. When Louis Armstrong was asked to define jazz, he replied, "Man, if you gotta ask, you'll never know." Bix Beiderbecke once said, "One thing I like about jazz, kid, is that I don't know what's going to happen next. Do you?" On the more seasoned side of the musical spectrum, Olu Dara serves up "an eclectic mix of blues, jazz, and storytelling, with tinges of funk, African popular music, and reggae." While he has been making music for more than three decades, during which time he has won numerous awards -- including a 1999 Audelco Lifetime Achievement Award for his theater work -- and while he has been oft compared to the legendary Louis Armstrong, you might not even know his name. For many years, Dara took a back seat to big names like Art Blakey, David Murray, and Henry Threadgill. Just under a decade ago, he finally stepped forward with his record debut, proving himself as a worthy leader, as well. You won't want to miss this trumpet virtuoso.